Mueang Kao Thai Cuisine Lunch Set As Low As RM13.90? OMG! After that Phuket trip, I was looking for a mango sticky rice and green curry that similar to what I have tasted before and you know what! I think Mueang Kao Thai Cuisine might killing it and they have an affordable wide range of lunch set that you can enjoy 😻 가자! Do you know the name of this each dishes? 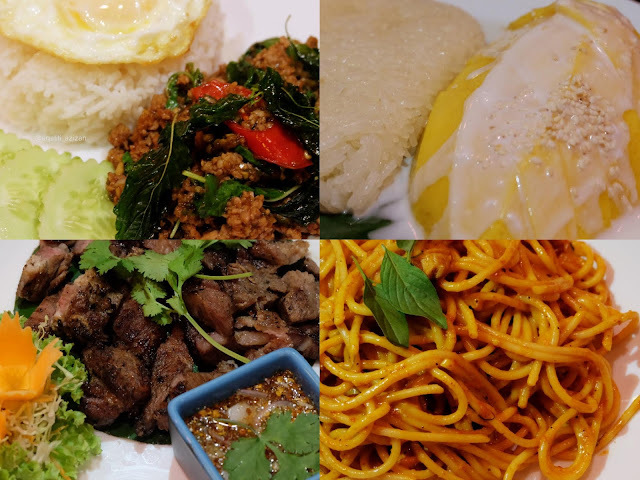 Thai food flavours are balanced, you will get a sour, sweet, salty, bitter and spicy in one dishes that makes you want to come back for more! I know I always posted about Japanese or Korean food on my blog but I kind of grow up with Thai food. Basically, when my family and I went out we always look for Thai food. Thank god there are a few delicious stalls in our area but it was a basic thing like Tom Yam seafood or steamed siakap (seabass). I'm honestly okay with that but since there are tons of delicious Thai food, I need to try ALLL OF ITT. Since Mueang Kao Thai Cuisine served an authentic Thai Cuisine and they brought a Thai chef to the restaurant. Oh well, it's something to look forward! Address: No. 21 (Ground Floor), Jalan SS 22/11, Damansara Jaya, Petaling Jaya. Based on my experience on getting there, it's easy to access by public transportation as it was just 8 min. drive from MRT TTDI. If you want to drive there also can but be patient to search for parking. 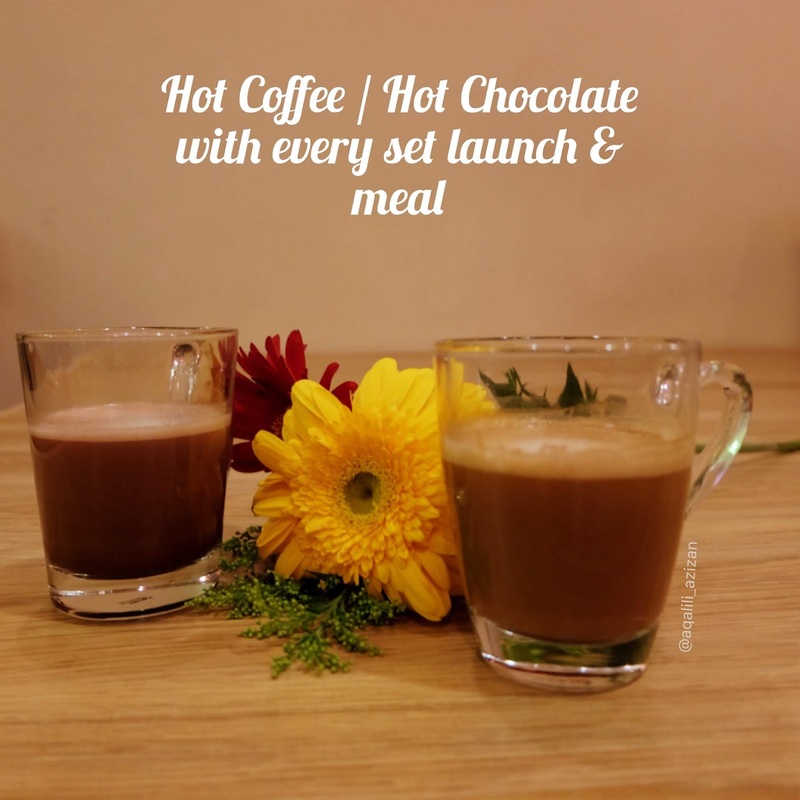 Both set will be available from 11:00 AM until 2:30 PM, and each dishes comes with a cup of italian hot coffee or hot chocolate. If you ask me I prefer hot chocolate because I didn't like coffee that much, but my friends said it was a delicious cup of coffee! Don't be afraid of the name because it ain't that spicey. Both chicken & seafood taste really good. If you've taste green curry alone, imagine it was absorb into the pasta you will be tasting that creaminess, sweet and sour curry. They're generous with the chicken and peas, no worries! If I could be one favourite out of this 3 dishes, it would be this and I think everyone would agree. I can't imagine that otak-otak that I always eat would be interpret in pasta dishes. It kind of replicate carbonara but on it owns unique way. Welcome to the rice valley where it was my fave part and I can't live a day without eating rice (true story). There are 7 dishes to choose from and it's included rice and fried egg. 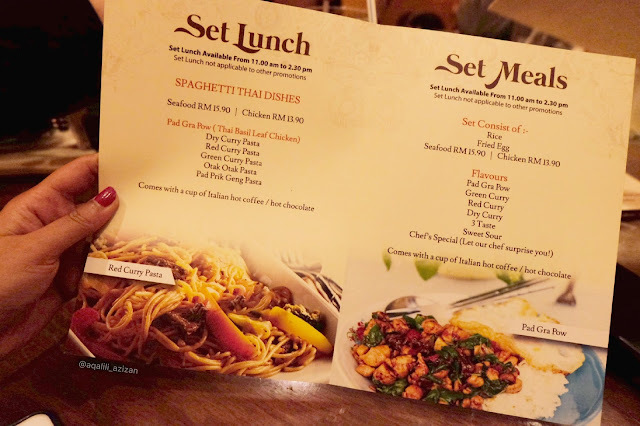 Take note that you can choose either Chicken (RM13.90) or Seafood (RM15.90). Out of the 7 dishes, the best part is Chef's Special because you will be surprise by the chef! Pad gra pow means thai basil leaf chicken. Usually, they will cut chicken in a small pieces, cooked it with soy sauce, fish sauce and others. It will be full of flavour and easy to bite with, I can say it's kind of melted in my mouth. It's similar to what I've tasted in Phuket and it just bring back those sweet memories. Cooked with red curry and coconut milk, this dish can't get any more delicious! It was full of flavour and the coconut milk aren't that overwhelming. Honestly, I can't taste taste any differences between regular curry about this dish. But, I would say it was less curry powder and spices which why I like the dry curry. Like I mentioned earlier if there are sweet, sour, salty and spicy then your 3 taste dishes has succeed. I like this dish because the chicken is crunchy and it makes everything taste delicious. Nothing couldn't go wrong with this dishes. It was complete with sweet and sour flavour, I just hope that the chicken will be crispy so it can create that awesome combination. My chef's special dish that day is Yum Soba Chicken. Ya, I know soba originate from Japanese but the chef combine 3 country in one dishes. The sweet and sour of the sauce combine with the cheese made me feel really exclusive. Hope when I come back again, the chef will be cooking this one! I'm gonna create new rules: You can't leave this restaurant without trying one of their dessert! Since the chef originate from Thailand, we have mango sticky rice, red ruby, coconut ice cream and coconut tapioca. 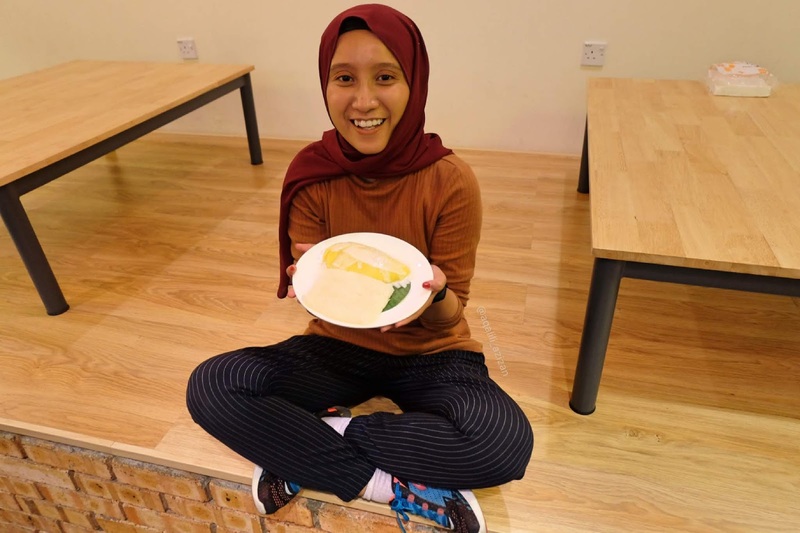 I can't get enough of mango sticky rice at all, well it's the best combination ever! The dish aren't that sweet, generous sticky rice and it just complete your lunch course. My friend said this dessert are very popular in Thailand, and it's because they made the ruby thingy from scratch. People said it's refreshing , I do agree with that and it's remind me of bubur cha cha! This is the winner for dessert. Forget your mainstream coconut ice cream shop, make sure to come here and taste the real deal one. It's super delicious and crunchy with all the condiments on the top. 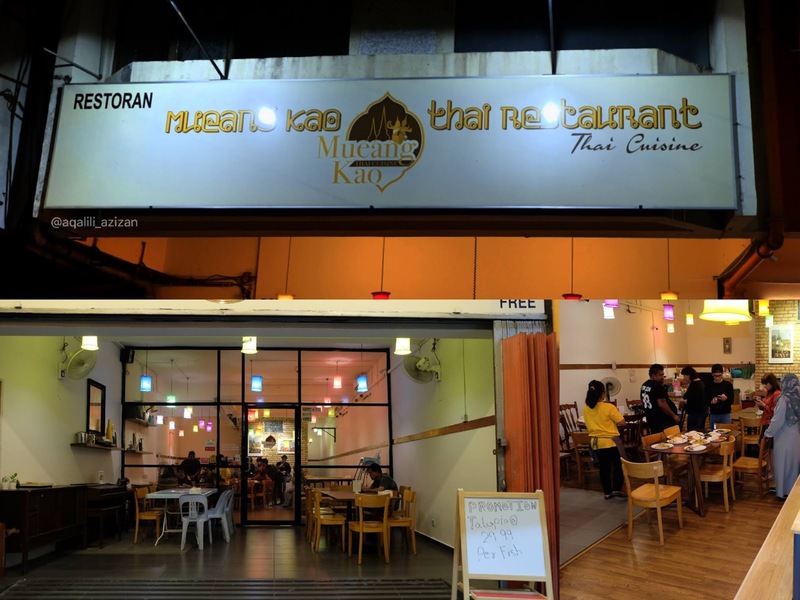 The newest family at Mueang Kao Thai will be your next Tomyam and Pad Gra Pow when you dine here. 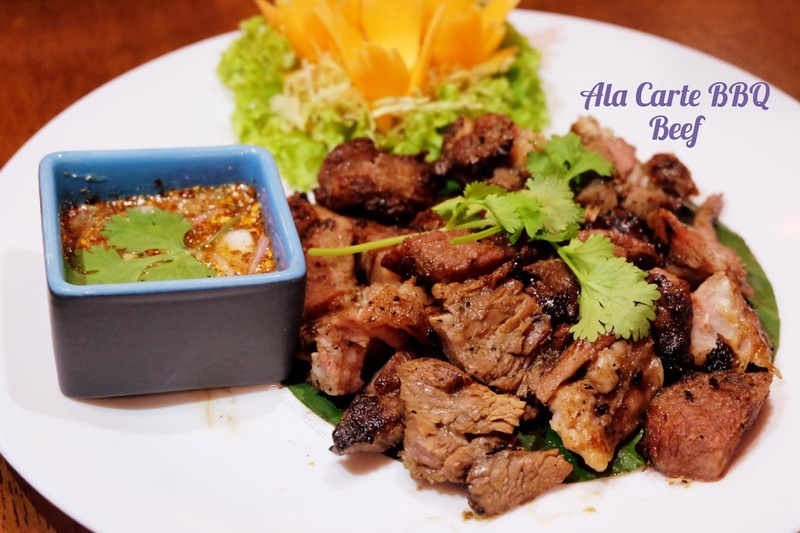 With just RM25 you will get this juicy New Zealand BBQ beef. I'm in a really happy place when I ate this, with the special sauce my lunch basically ended! Where I Buy My Kpop Album in Malaysia?